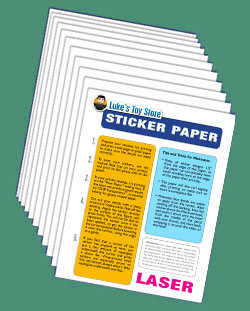 Use this vinyl inkjet sticker paper along with your inkjet printer to create your own Minimate decals, along with tons of other uses! We have been experimenting with different brands of inkjet sticker paper for over a year, and this is by far the best product on the market for Minimate use. The only tools you will need to apply your own stickers are a sharp scissors or hobby knife and super glue. The paper has a matte finish, so we also recommend using clear acrylic paint (semi-gloss or satin finish) on your finished customs. 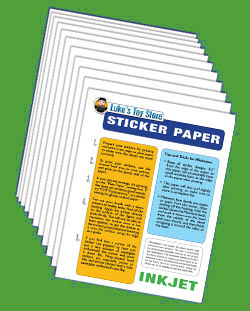 This pack includes 10 sheets of 8.5" x 11" white vinyl sticker paper for use in inkjet printers only. A full set of instructions is included, along with tips and tricks for getting the best results. 1499 Lukers will be rewarded to you when you buy this item.